William Bornstein answering questions from press and organizations attending the January 15, 2014, press conference in Washington, DC. U.S. 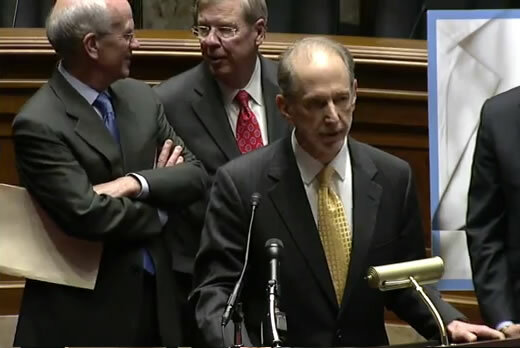 Senators Ron Wyden, D-Ore., and Johnny Isakson, R-Ga., and U.S. Representatives Erik Paulsen, R-Minn., and Peter Welch, D-Vt., introduce the Better Care, Lower Cost Act at a press conference January 15, 2014. William Bornstein, MD, PhD, chief medical and quality officer for Emory Healthcare, joined four prominent lawmakers at a Washington, DC, news conference on Jan. 15, 2014, to introduce Better Care, Lower Cost, a bi-partisan bill calling for a patient-centered approach to Medicare coverage and care for beneficiaries with two or more chronic conditions. Crafted by Sen. Johnny Isakson, R-Ga., Sen. Ron Wyden, D-Ore., Rep. Erik Paulsen, R-Minn. and Rep. Peter Welch, D-Vt., the bill removes the barriers that prevent Medicare providers from building upon existing successful delivery models, and helps ensure seniors have access to specialized, patient-centered chronic care no matter where they live. Removes federal rules and practices that prevent providers from specializing in chronic care and from targeting higher-risk patients who would benefit most from specialized, targeted care. Empowers nurses and physicians to lead care teams essential to better quality, less expensive care. Prioritizes areas of the country where chronic disease is most prevalent. "As chief medical officer and as a practicing endocrinologist I know firsthand the challenges faced by our seniors with multiple chronic medical conditions," said Bornstein. "Our physicians, nurses and staff make heroic efforts every day, and we do a good job of treating illnesses, but are frustrated in treating our patients by a system that is focused on individual encounters and procedures rather than long-term relationships that continue between office visits and hospitalizations." According to the Centers for Medicare and Medicaid Services, in 2010, 68 percent of Medicare beneficiaries had at least two or more chronic conditions. In addition, beneficiaries with at least two or more chronic conditions accounted for 93 percent of Medicare spending, or roughly $487 billion. "I believe that the best and most innovative solutions come from the private sector and people on the ground, and my hope is that the Better Care, Lower Cost Act will unleash the creativity of the medical community to develop ways to provide better care at a lower cost," said Isakson. "I'm proud to join Sen. Wyden in introducing this legislation, which addresses our health care system's challenge of managing chronic medical conditions by allowing patients to voluntarily enroll in a program that incentivizes health care providers to invest in prevention. I encourage my Senate colleagues to support this legislation because it is critical to the future of Medicare and our health care system." 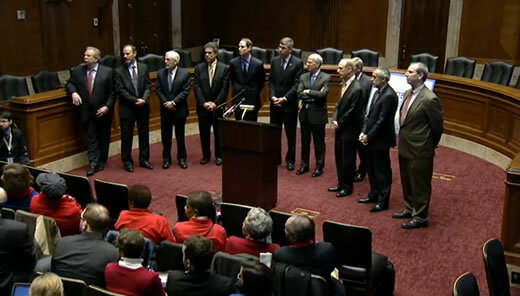 Senators and healthcare experts take questions following the press conference, held January 15, 2014, in Washington, DC.